Recent History: The distinctive shoulders with the thin lower collar had the back part cut away in order to become a “walk-in” prop for Doctor Who Exhibitions. These shoulders could be seen at MOMI (The Museum of the Moving image) in the early 90s, and then in later years at Llangollen. 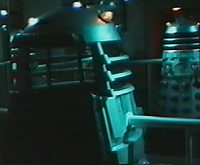 The shoulders also technically made one additional “screen appearance” in the opening moments of the 1993 VHS video release entitled Daleks – The Early Years, in which Peter Davison introduced the programme whilst speaking from inside the prop – although his voice was dubbed with a clip of Roy Skelton saying “Exterminate”. Collector Chris Balcombe had possession of the corresponding cut-away piece for about a decade. Then, in 2010 the “walk-in” Exhibition prop came up for auction and it was purchased by The Prop Gallery, who were also able to buy the removed back panels and hand it all over to Mike Tucker to reunite the two sections and perform sympathetic restoration on the prop. The result was that the shoulders of the Shawcraft original became once again part of a complete prop, restored to its last television appearance in 1988. 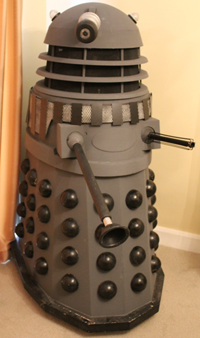 In the summer of 2011 The Prop Gallery sold the complete Dalek back to Chris Balcombe where it has quickly become one of his most prized possessions. Fate: Unknown. This original Shawcraft skirt had featured in every Dalek story of the 1960s but at some point during the five year hiatus after Evil of the Daleks and before Day of the Daleks was made the BBC had cleared out their prop stores and the skirt was deemed redundant. However before it finally disappeared it had a number of public and TV appearances. Firstly in October 1967 it made a visit to the BBC Centre in Cardiff and just a month later it was back in London for a Blue Peter photoshoot to publicise their Design-a-Monster competition. Its last appearance would be in the New Year of 1968 when it was exhibited at the Boys and Girls Exhibition in London’s Olympia hall. Here it was paired again with the shoulders of Dalek Seven and also appearing were the three winners of the Blue Peter competition. Recent History: The shoulders of Dalek Two went through some early changes. Having been part of one of the props originally leant to Barnardos, it had received some rough handling and the gunboxes were in particularly bad condition. 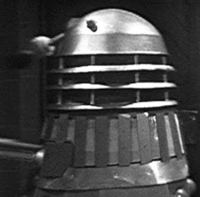 The BBC retained Dalek Two after The Dalek Invasion of Earth and at the time of The Chase it was decided that the boxes should be replaced, and as such a set of fibreglass movie boxes were transplanted to the shoulders. The collars were retained and so kept its distinctive lower collar ‘lift’. A few years after their last full appearance in The Evil of the Daleks, they were reportedly thrown out by the BBC. Bernard Wilkie says he rescued these shoulders along with Dalek Eight‘s thin skirt from this purge, and from that point onward the two mismatched halves were known as the “Wilkie Dalek”. He kept the prop in a barn for many years and then allowed it to be displayed in Doctor Who Exhibitions, before being auctioned off in 2010. The prop was bought by The Prop Gallery who carried out some sympathetic restoration, and since these pictures (left) has had the original components of the proper neck restored. Soon after, The Prop Gallery sold the prop and it is now part of the collection of Hollywood director Peter Jackson. 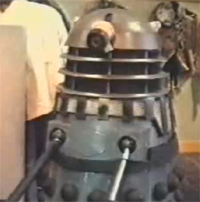 Recent History: The skirt of Dalek Two was last used on television in the mid-seventies but continued to make appearances at conventions and PR events throughout the 1980s. In the 1990s whilst in private hands it was used in numerous publicity stunts in tandem with a national newspaper and took part in photo-shoots around London’s famous landmarks. For many years it could be hired for private parties and it was promoted as an original TV prop in the adverts. Despite such a high profile, and even with the paperwork to authenticate its use on screen, its existence was largely overlooked by the Dalek world for years. It was recently sold to a private collector. Full a complete analysis, click here to read about this original Shawcraft Dalek skirt. Fate Unknown. After the second Dalek serial was recorded, two props were returned to the children’s charity Dr Barnardo’s as per their agreement with the BBC. One wasn’t the original prop that had been donated and borrowed back, but no doubt the charity had little care as long as they could continue their publicity work and money-raising. 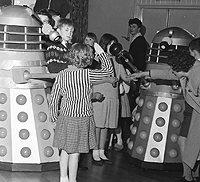 There are several photos from the 1960s showing that the two Daleks travelled the country entertaining children in such places as Thanet and Street in Somerset. The Stepney Causeway home closed in 1969 and there were tales of one prop remaining in the grounds for a short time after the closure. The prop then vanished and it remains unclear whether they were junked, relocated as part of the charity’s move, or spirited away by persons unknown. Recent History: Two new Daleks were built for The Dalek Invasion of Earth, but pretty rapidly the shoulders and skirts of the new pair started swapping. By the time of Patrick Troughton’s first story, they had swapped for good, and the Dalek which was made up of the top half of Dalek Five and the skirt of Dalek Six was kept by Bill Roberts st Shawcraft for promotional work. It appeared in home movie footage entitled Follow That Dalek before its last screen outing in Evil of the Daleks, and thereafter remained at the Shawcraft workshops. It was used periodically for local charity events. Photos of Bill Roberts with this prop, and further photos from the 1980s show that the gun and the arm were swapped over. After its time at Shawcraft the prop was then acquired by Stuart Evans, whose extremely accurate models were marketed in the 1980s and 1990s under the name ‘Sevans’. 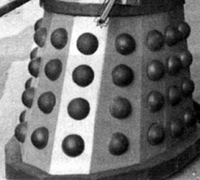 Whereabouts Unknown: Separated early on from its original shoulder section and paired with the top half of Dalek Six, the skirt of Dalek Five remained in active service until the penultimate Dalek serial of the original TV series, Revelation of the Daleks. This skirt was always easily identifiable via the three bolts on the side panels which appeared in Power of the Daleks, and they can be spotted throughout three decades of television work. Its fate after 1985 is unknown. 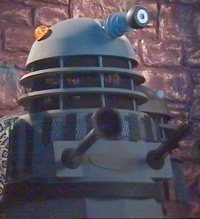 Recent History: The shoulders of Dalek Six, originally built for The Dalek Invasion of Earth in 1964 underwent considerable refurbishment in the early 70s and gained their distinctive four bolts on the front. Having posed naked with Katy Manning and continuing to be put to use on television, they made their last screen appearance facing Colin Baker’s Doctor. The two year gap that followed until the final “classic series” Dalek story saw them removed from the pool of television props and become paired up with the ‘oddball’ skirt. The shoulders thereafter stayed paired with the Exhibition skirt and together they were referred to as the ‘Tussauds Dalek’. This prop went up for auction for charity in 1986 when it fetched £4,600 and then again in 2005 where it had been returned to its famous Tussauds colours. It was given a second refurbishment restoring the correct oval size and tidying the slats and mesh. It fetched a massive £36,000. Again it was auctioned in 2009 and purchased by Steve Murray. 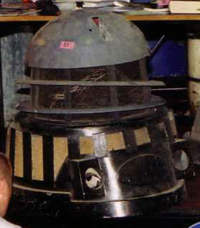 Steve had repainted the prop to its Dalek Supreme look and then to a Seventies grey although the prop was sold on to The Prop Gallery in 2011. They then resold it again and is now part of the collection of Hollywood director Peter Jackson. 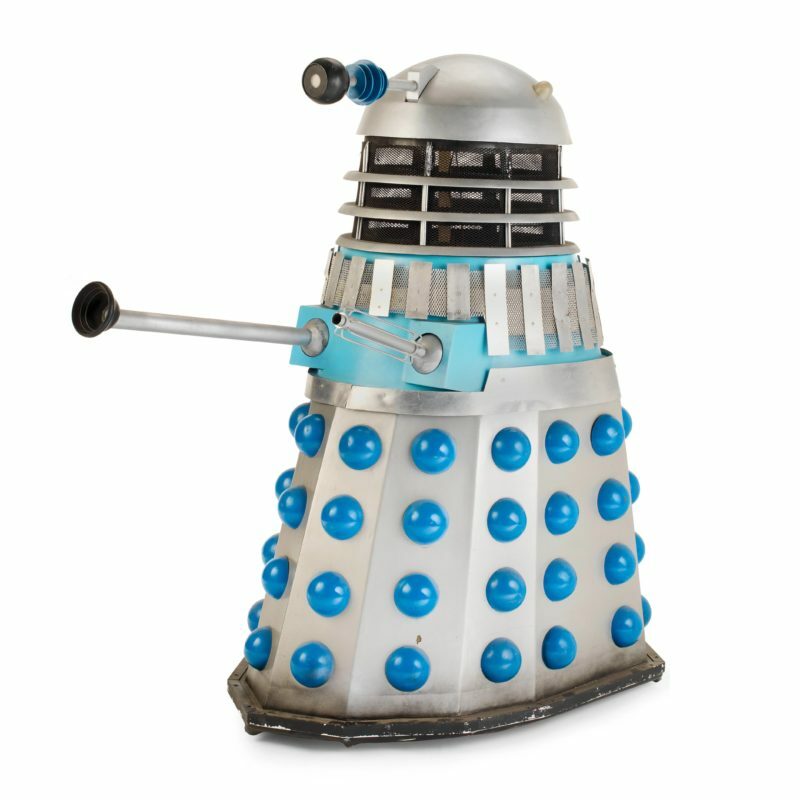 Recent History: The skirt of Dalek Six was swapped back and forth with the shoulders of Dalek Five during the mid-sixties, only for it to be withdrawn from service after Evil of the Daleks. The prop however had an active retirement at the hands of Bill Roberts and ultimately passed into the possession of Stuart Evans. 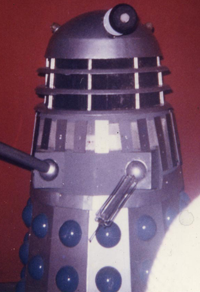 It was displayed at one time at Trowbridge along with Stuart Evans’s original film prop, and the blue hemisphere paint from the Dalek’s 1960s could clearly be seen under the black paintwork. 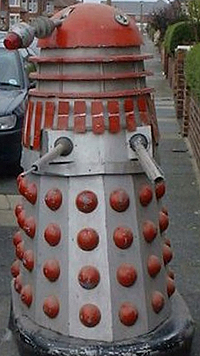 Whereabouts Unknown: – This Dalek was originally built in 1965 lacking the normal workings required for TV Daleks. When it was called up for screen use it was very much abused during recording The Chase. It became refurbished and swapped into the pool of TV props. This set of shoulders with its distinctive movie-mould gunboxes was used throughout the entire run of Doctor Who and included in the final “classic series” Dalek story featuring Sylvester McCoy – Remembrance of the Daleks, during which it was paired with the skirt of Goon v. The complete prop came up for auction in 1991 where it fetched £6400. 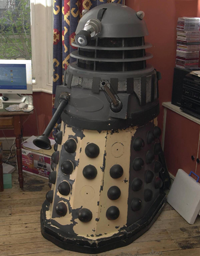 In May 2011 the complete Dalek made a surprise reappearance on TV as part of Channel 4’s Four Rooms TV series. The show sees four sellers hoping to sell their ‘gems’ to well-known dealers. The owner hoped to sell the Dalek for £50,000 but it remained unsold having been unable to persuade the dealers to part with their cash. It was still in good in condition and obviously well cared for over the years since its last appearance. Recent History: – This movie-style skirt was built in 1965 but never appeared on the big screen, instead making its debut in The Chase as a “stunt Dalek”, before finally being refurbished and kitted-out to appear as a hero prop in The Power of the Daleks. Its telltale misaligned hemispheres could be tracked easily through three decades of television work and it last appearance in Doctor Who was with the Seventh Doctor in 1988, paired up with the shoulders of Dalek One. After its last TV work, its rear panels were cut away as part of an adaptation for a “walk-in” exhibit for a Doctor Who Exhibition. The panels that were removed were retained by Chris Balcombe until the main front part of the skirt came up for auction in 2010, whereupon all the components were bought by The Prop Gallery. Doctor Who FX veteran Mike Tucker performed the reunification of the Dalek and restored it to its last screen appearance. 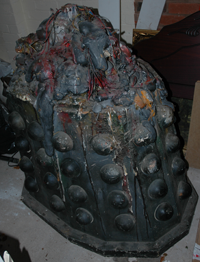 In the summer of 2011 The Prop Gallery sold the complete Dalek back to Chris Balcombe where it has quickly become one of his most prized possessions. 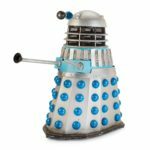 Recent History: – Dalek Eight is an oddity of Dalek prop history. It consisted of the famously thin prop used only in Evil of the Daleks with no real explanation of why it was constructed the way it was. Stories abound that it was because a thin Dalek was needed to go through doors on location but existing telesnaps of the story would suggest that was not the case as a ‘normal’ Dalek can be seen passing through one. The complete prop was made to be thinner than a regular Dalek with the skirt having just one row of hemispheres on its back panel. The shoulders, therefore, also had to be made thinner to fit the skirt. The shoulder section was never used again and was presumed junked sometime after Evil of the Daleks finished filming. Recent History: – The skirt of Dalek Eight has a somewhat more interesting history than its shoulders. After filming it was briefly used in the final episode of The War Games in 1969 as part of the second Doctors defence in his trial. Here it was paired with Dalek Seven’s shoulders and Dalek Two’s neck with its obvious repair. It was rescued from junking, along with the shoulders of Dalek Two, by Bernard Wilkie who wanted it as a play thing for his children. It resided in his barn for many years, until he learned of the Doctor Who exhibition to be held at the Museum of Moving Image (Momi) in 1991. 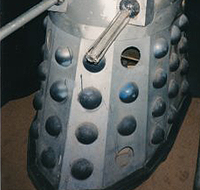 He donated the prop to the exhibition where it was displayed as a ‘destroyed’ Dalek with its top half hanging over the shoulders to disguise the size difference. By this time the original neck had collapsed and a replacement was in place instead. The prop disappeared again for some years (after the closure of the Momi display) until new exhibitions began to spring up with the arrival of the New Series where it was on near constant display up and down the country. It was finally auctioned in 2010 when it was purchased by The Prop Gallery, who has since carried out some gentle restoration. Soon after they sold the prop and its now part of the collection of Hollywood director Peter Jackson. In recent years it has become known as The Wilkie Dalek. 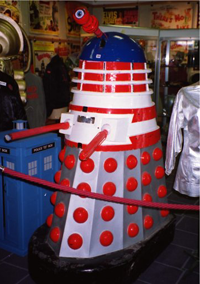 Recent History: – Having been built for exhibition purposes in the late 1970s and being paired with firstly the shoulders of Goon vi for Destiny of the Daleks it then was paired with the shoulders of Dalek Six when it was displayed at Madame Tussauds. Together they have become perhaps the most recognisable of the Dalek props and after its final screen use in Revelation of the Daleks, was auctioned in 1986 in aid of the Red Cross where it has seen some heavy refurbishment. The prop came up for auction again in 2003 but was withdrawn. Then again in 2005 it came up again but this time it had been returned to its famous Tussauds colours of blue and silver. It was given a second refurbishment restoring the correct oval size and tidying the slats and mesh. It fetched a massive £36,000. Again it was auctioned in 2009 and purchased by Steve Murray. 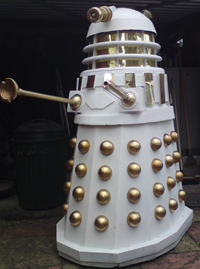 Steve had repainted the prop to its Dalek Supreme look and then to a Seventies grey but in 2011 sold on the complete prop to The Prop Gallery. Soon after they sold on the prop again and it is now part of the collection of Hollywood director Peter Jackson. Recent History: – The Goon props were made for Planet of the Daleks with various complete props and sections going on to appear throughout the rest of the show’s history. One such section was the skirt of Goon v. Having become separated from its top half it was paired with the shoulders of Dalek Seven from Resurrection of the Daleks until Remembrance of the Daleks. The complete prop was auctioned in 1991. 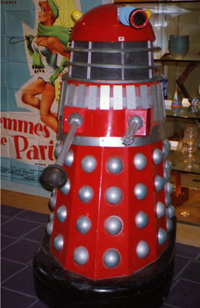 Recent History: – The Supreme Dalek from Remembrance of the Daleks was assembled in 1987 by Martin Wilkie (son of veteran visual effects expert Bernard) and Lorne Martin from a mix of Dalek N2 and the Blackpool exhibition Daleks. It was used by BBC Worldwide for promotional work before appearing in the show in 1988, and after it was returned to those sorts of duties. It was used during promotion of the 30th anniversary and on the cover of Mike Tucker and Sophie Aldred’s book Ace before being painted black and gold and featuring on ‘Red Dwarf’ night on the BBC in 1998. 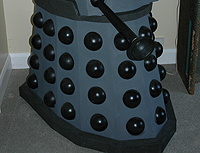 The prop was then painted into a grey and black finish and appeared in the Comic Relief skit ‘The Curse of Fatal Death’ in 1999 along side two Imperial Style Daleks constructed for the Children’s Royal Variety Performance in 1994 alongside some fan built Daleks. At this point it had been given a new neck cage, lights and eye. The prop featured on the cover of DWM in 2000 in its black and gold finish although these pictures were taken some months before. The prop remained in its grey and black finish for some years after its Comic Relief appearance but was recently returned to its ‘Remembrance’ look. It currently resides in a private collection. Recent History: – This prop only appeared once in Doctor Who before being refurbished and sent to the USA as part of the travelling exhibition tour launched in 1986. The refurbishment included a new coat of paint, tidying the shoulder mesh and repairing the prominent chip in the oval. A new unique eye had also been added. When the tour was over the prop was returned to the UK where it made a brief appearance in the BSB ’31 Who’ celebration weekend. It was also used in several exhibitions across the country including the Bristol Exploratory and Momi. For these appearances it was refurbished again with lights and an arm from an Imperial Dalek. The slats were also given a gold foil finish and the mesh was removed to complete the Imperial look. The Dalek eventually found its way to the Blackpool exhibition, via the Dapol exhibition at Llangollen, where it had been repainted black and gold. The prop was auctioned by Bonhams in 2010 and is now back in the USA as part of a private collection. Recent History: – Comprising of a mix of two of the four props constructed Revelation of the Daleks, Dalek N3-N4 was refurbished for use in Remembrance of the Daleks. The BBC retained this prop although it was left and slowly decayed but was saved from junking in 1994. The prop was minus its dome, hemispheres and neck cage. It was restored by Derek Handley who constructed a Shawcraft style neck cage for the prop, added a new upper collar, mesh and slats, and gave it a smart red and black paint scheme. The new dome came from the Imperial Dalek moulds. After appearing in a short item about Verity Lambert in January 1996 it was retired and was partially returned to a ‘Remembrance’ look. 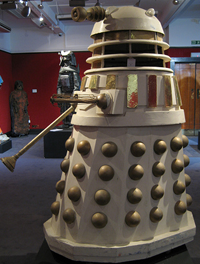 In August 2012 it was revealed that Mike Tucker had fully refurbished the Dalek back to its ‘Remembrance’ look and is now in the collection of The Prop Gallery. 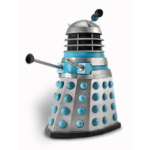 Recent History: – This Dalek is the inverse mix of Dalek N3-N4. Both props were originally used in Revelation of the Daleks but became mixed during use in Remembrance of the Daleks in 1988. The prop came up for auction in 1991 at Bonhams with Dalek Seven-v and made a brief appearance on Blue Peter in a promotion for the sale. It was sold to a private collector and now resides in London. 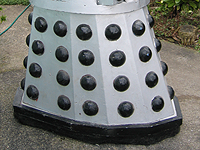 Recent History: – The shoulder section of this Dalek was constructed for the 1984 Liverpool Garden Festival and noticeably different to the other Necros props built in 1985 due to its narrower boxes. 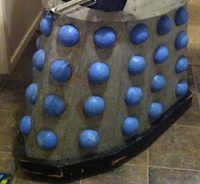 Dalek N5 lost its skirt section when it was donated to the Dalek Emperor prop to save constructing a new one. Having been in storage for some time the shoulder section was utilised as part of a special effects Dalek that was created for use at the 1994 Longleat Doctor Who day. Fitted with a newly created skirt and neck section, the prop was spectacularly blown up as part of a demonstration. The shoulder section came up for auction at another Longleat Doctor Who day in 2000. It came with an original dome, most often associated with Dalek One-7 and showed the large rear chip that was apparent in The Five Doctors. The neck was also from Dalek One-7 during its time in Remembrance of the Daleks, but had been converted at some point for a special effect and the remains of a flash charge could now be seen inside. 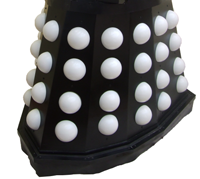 Recent History: – Four Imperial Daleks were made for Remembrance of the Daleks. 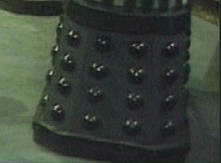 The BBC retained one of these which was marked with a ‘1’ inside the skirt, shoulders and dome therefore known as Dalek I1. The prop was refurbished in 1994 into a grey and black finish and fitted with smaller hemispheres to appear at the Children’s Royal Variety performance in May of the same year alongside two newly created Imperial style props also painted in grey and black. It has recently been returned to its white and gold finish and is retained in a private collection. The three other Imperial props were given to BBC Exhibitions. November 1988 would see the Space Adventure attraction at Tooley Street in London add a small Doctor Who exhibition. This was mainly made up from the props that returned from the USA Tour (including Dalek N1) but in August 1989 Dalek I4 and The Emperor prop were added. Dalek I4 had new lights fitted that were smaller versions of the standard Imperial style. Over the short time the prop was there eager collectors were able to take the gold sheets from the slats leaving them completely white by the time the attraction closed in November. November 1990 would see BBC Radio 2 offer an Imperial Dalek in their annual auction for the BBC’s own Children in Need charity. Dalek I3 was selected and given a spruce up for the occasion. London shopkeeper Nick Brummitt from Walthamstow had the winning bid at £1700 and the story making the national newspapers. 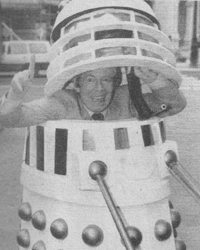 It was photographed with broadcaster Derek Jameson sat inside with the comparison being made that Jameson’s unusual voice sounded like a Dalek. It came up for auction again a few months later in August 1991 when it made a fine return at £3500. Its whereabouts now is unknown. 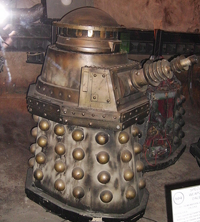 The final two Imperial props, Dalek I2 and Dalek I4, were used as exhibition and loan props. 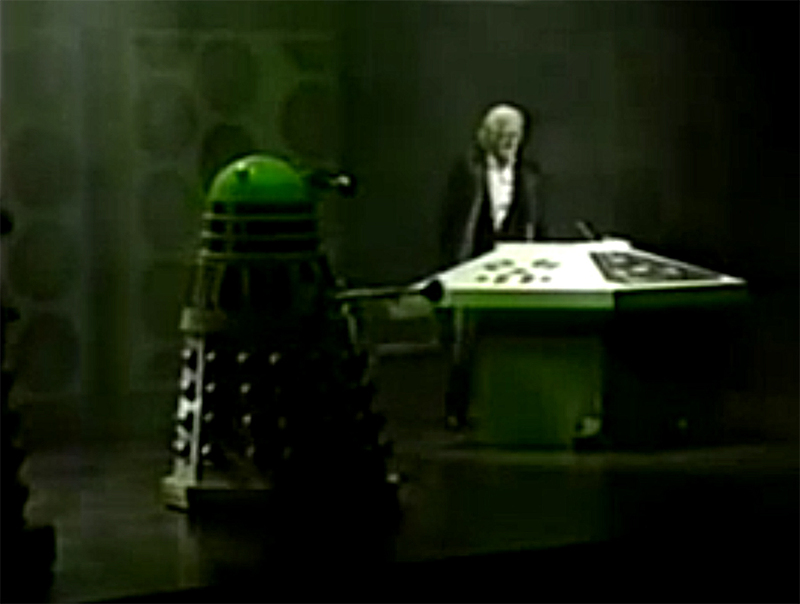 An early outing matched the Daleks to Jon Pertwee once again when he was hired to perform at the Vodafone Roadshow in December 1991. David Solly, who worked in the exhibition department of the Racal Group (who founded Vodafone), was asked to come up with a themed conference and roadshow. Solly was a Doctor Who fan, as was one of the managers at Racal, and so a Doctor Who theme was dreamt up. After securing Jon Pertwee, Solly then dealt with the BBC to hire the two Dalek props and Terry Nation’s estate on how they could be used. Nation insisted that in the script the Daleks must retain their evil character and were not ultimately defeated. The props themselves were already showing sign of age by this time. Cracks had appeared in the boxes, one set of lights was missing and the frame for mounting the castors was also missing in one of the Daleks. Solly replaced the gold foil on the shoulders that was also badly damaged. Two conferences were held, one at Wembley where only Dalek I4 was used and one at ‘Quaffers’ in Manchester where both Daleks were used with Dalek I2 remaining static after appearing from a hydraulic lift in the stage. Two other Daleks were supplied by Toby Chamberlain. They were next seen together at the Isle of Wight exhibition at Alum Bay which opened in 1992. The display was made to look like the school cellar as featured in Remembrance of the Daleks and also included the Dalek transmat device. In the intervening years since the serial was made the Imperial style lights had gone missing and were replaced here with large orange lamps quite unlike anything seen previously. 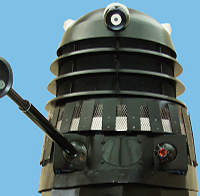 Dalek I4 also had a small bulb fitted to the end of its gun to give the appearance of a firing laser. When the exhibition closed, the sections were mixed up to create two new Daleks. Dalek I2-I41 was sent to the Dapol exhibition at Llangollen before finally ending up at Blackpool. When that closed it was auctioned at Bonhams in 2010 as part of a bigger sale of Doctor Who props and fetched a handsome £15,600. It now resides in a collection in the USA. The whereabouts of Dalek I4-I2 is unknown. Recent History: – Specifically made for use in Remembrance of the Daleks, this prop therefore saw very little screen time. It has however had a busy life since, visiting many exhibitions across the UK including Longleat and Momi. An additional red light was added to the end of the gun at some point for the exhibition use. It has most recently been seen at second Blackpool exhibition, and has now made home at the new Doctor Who Experience mega exhibition and shop in Cardiff.. In 2012 it made a surprise reappearance in the New Series of Doctor Who in an episode called Asylum of the Daleks. It appeared in the asylum itself where it stood static in at least one scene. Mike Tucker had restored the prop to its original screen look and is, at this time, the only complete Dalek prop to feature in both the ‘Classic’ and ‘New Series’ of Doctor Who. Recent History: – The Emperor Dalek’s only appearance on-screen in Doctor Who was in Remembrance of the Daleks and had been especially constructed for that story. The large spherical top section was fabricated from a left-over prop from the BBC medical show, Bodymatters. The skirt section was that of Dalek N5 having been stripped and repainted into the Imperial livery in the period between location filming and studio taping. Although only used on-screen once in Doctor Who, the prop has been used prominently at many exhibitions ever since and most recently at the now closed Blackpool Exhibition. A closer inspection of the fender section reveals that the two small holes made for the wires to pull Dalek N5 in its destruction scene (and to pull the Emperor in later scenes) are still apparent. The prop was refurbished in 2015 by The Model Unit and can now be seen at The Doctor Who Experience in Cardiff. Recent History: – This skirt was originally constructed for use in Revelation of the Daleks and included a dead mutant, panels that could be removed to reveal interior details and extra underside elements. When the location shooting schedule was abandoned due to poor weather the skirt remained unused. However, it was perfect for use in 1988s Remembrance of the Daleks. But his time it was painted into the Renegade Dalek livery of black and grey and acted as the first Dalek to be destroyed in the junkyard. The two panels were due to fly of in the resulting explosion but the effect failed. Extra Dalek ‘gore’ was also added for later scenes. The skirt section was seen at various exhibitions after the broadcast including Longleat, Dapol and Blackpool before coming up for auction in 2010. The Prop Gallery purchased it and resold it at a later date to a private collector. By 2018, it was in the hands of another prop dealer who has sold various chunks of of the ‘gore’ from the top and cut up sections of the skirt to sell panels with an individual hemisphere on. One of the lightweight SFX panels is also known to be in a private collection. NSD4 is revealed at Sudbury Hall in October 2018. Click for a larger view. Recent History: Originally constructed by Specialist Models for Series Two of the ‘New Series’ in 2006, the prop was used consistently up to its final appearance in Doctor Who in Series Nine’s two-part Dalek tale. However, its last TV appearance came in November 2015 when it appeared as part of the Harry Hill’s TV Burp section of Children In Need. It’s final starring role was on the cover of Doctor Who Magazine’s 500th issue before coming up for auction at Bonhams in June 2016. However, it wasn’t the BBC that were selling the prop. Back in 2005, the Radio Times had run a competition to win a screen-used Dalek. The winner, Honey Jones-Hughes, was announced in April 2006. 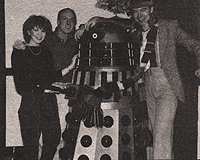 NSD3 had been used in promotion of the competition and was also pictured with Honey in the Radio Times. The new owner of the Dalek was unable to take it due to lack of space at home and so a ‘deal’ was struck whereby the BBC could continue to use the Dalek until the space was available. However, as NSD3 had been retired from use in 2009 after being on display in Blackpool, it was a different prop – NSD4, that was handed over when the time came. Retailers, The Who Shop, bought the Dalek but because of its tricky ‘one piece’ construction (and therefore size) they reluctantly sold the prop to Sudbury Hall in Derbyshire. 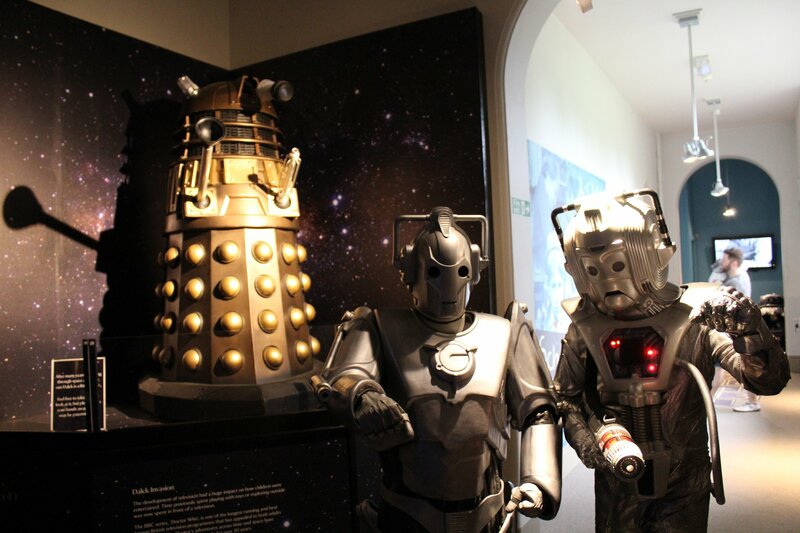 The hall is owned by The National Trust and they had received a lottery grant to enable them to purchase the Dalek for the ‘Museum of Childhood’. After some light restoration by Mike Tucker at The Model Unit, the prop is now on view to the public for years to come. AB1 photographed for Bonhams. Click for a larger view. Recent History: Owned by Andrew Beech, AB1 had been constructed in the early 1990s and came to be used at The Doctor Who Experience and appeared in the Dalek stories of Series Seven and Series Nine. More about its life can be read on our Series Five and subsequent pages. It came up for auction at Bonhams in December 2017 and was surprise for fans as they had assumed the Dalek collection seen at The Experience would be kept together for future appearances. The prop gained a respectable £17,500 (including premium) and would make its new home in the USA. Dalek AB2 photographed by Bonhams. Click for a larger view. 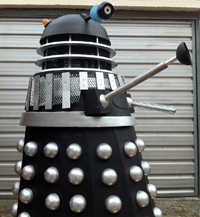 Recent History: This Dalek was also owned by Andrew Beech and followed an almost exact same line of history as Dalek AB1. It had received two earlier TV appearances – Summer Scene in 1992 and The Generation Game in 2000. More about its life can be read on our Series Five and subsequent pages. It came up for auction at Bonhams on 11th December 2018 and fetched £15,625 including premium. Recent History: – AARUII 2 was one of the three Dalek props given away by Sugar Puffs in their promotional competition for the second film. 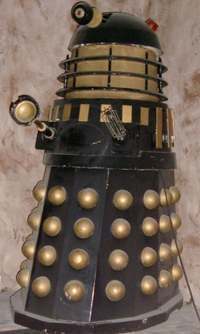 It was featured in a BBC Schools programme called Walrus in the early 1980s, a clip of which has recently been released on the Special Edition DVD version of Resurrection of the Daleks where it was painted to resemble the Dalek Supreme props from the TV series in the Sixties – IE Mainly black with blue hemispheres. It came up for auction in August 1992 at Bonhams where it had been given a repaint to a red and silver finish. 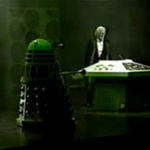 Shortly before the auction the Dalek had appeared alongside Dalek AB2 on the BBC magazine show ‘Summer Scene’. The show was previewing the auction and both Daleks chased a young Rob Brydon around The National Garden Show in Ebbw Vale! It has changed owners several times but most recently came up for Auction in June 2016 at Bamfords in Derby where it was part of a large collection to go on sale. It sold for £38,000 and is now in a private collection. 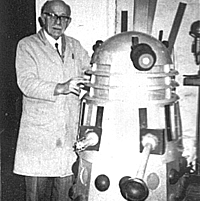 Recent History: – This prop was one of the dummy props constructed for the first Dalek film in 1965. Some of these were given away in a competition run by TV21 comic. This particular prop is believed to have been won originally by Keith Stark of South Woodford who eventually sold the Dalek to Bedford Round Table. They used the prop for charity purposes and gave it a rather garish paint scheme! It came up for auction in August 1992 at Bonhams although its current location is unknown. 1. Researcher Daniel O’Keeffe inspected the prop at the Dapol Exhibition and confirmed the numbers in the sections.